We rode out the big winds with minimal damage, so now I’m catching up on a post I neglected to update. 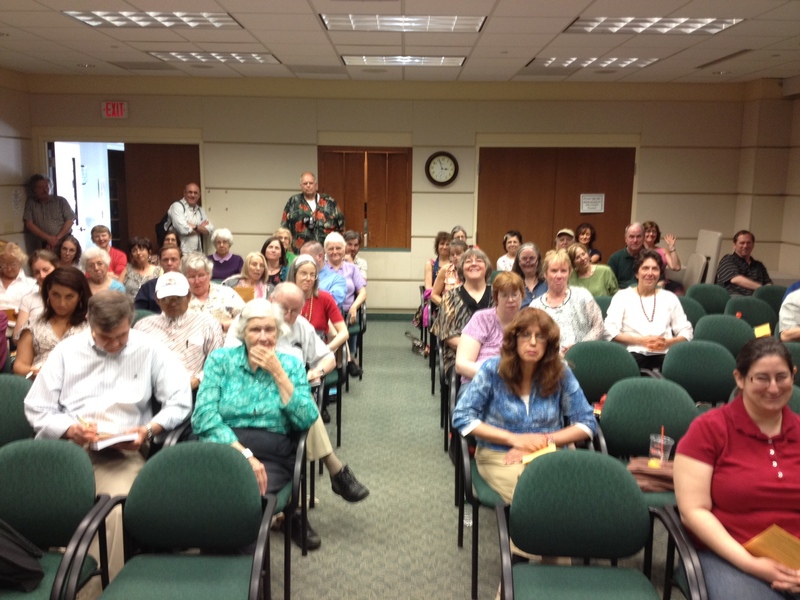 Anyway, last Saturday I attended the “Autumn Poetry Sampler,” a reading with four poets: Melinda Rizzo, Patricia Goodrich, Cleveland Wall & Geri Ann McLaughlin. It was held at a place called Greenshire Arts, a small arts and holistic studies facility just past Lake Nockamixon, near Quakertown, PA. Greenshire is a house converted to a series of gallery rooms. On this night the walls were decorated with photographs from Goodrich’s recent trip to Morocco. The poems she read that night were based on those photos. I especially liked the format for the reading. Each poet read one poem, then moved on to the next reader. This continued until each has read six or seven poems (none longer than 2-3 minutes). It made for a nice variety, and occasionally the poems played off each other unintentionally (since the readers swore they hadn’t planned things out that way). Some Moroccan-themed snacks were also available. Here’s a video from the reading. Unfortunately I missed the title of the first poem, and maybe the first line. Great line-up and the Ryerss Museum is one of the coolest venues for a reading. 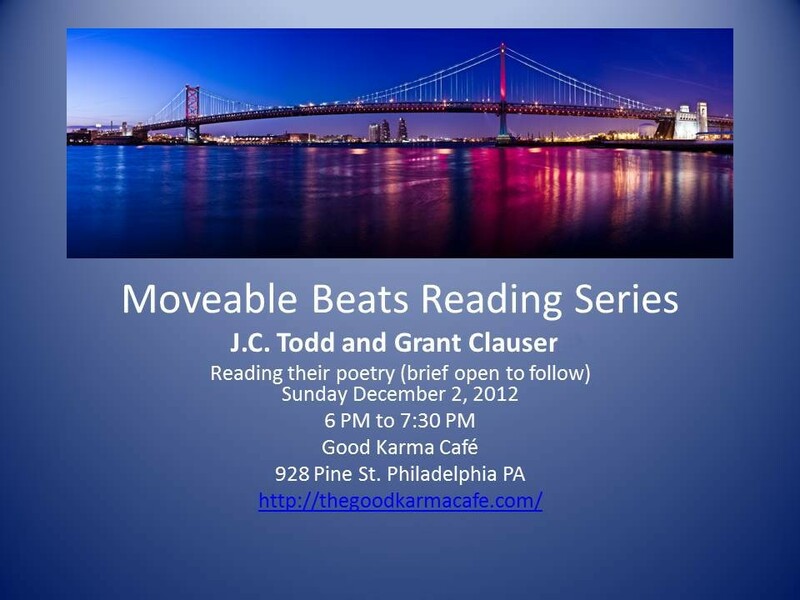 Join us for our last reading of 2012! 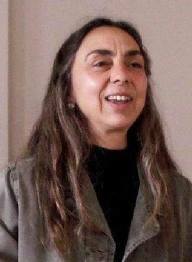 The Fox Chase Reading Series presents our featured poet/writers reading on October 28th @ 2pm featuring the poetry of Michele Belluomini and David Kozinski at Ryerss Museum and Library, 7370 Central Avenue, Philadelphia, Pa. 19111. The Featured Poets will be followed by an open mic. I went to the Jean Valentine reading last night at Bryn Mawr College last night. She’s a small woman who barely stood out behind the podium, but once she began reading, the room (packed, by the way) grew silent and attentive. Her reading style is sensitive, almost cautious of each word’s footing into the space. It was a entrancing evening. 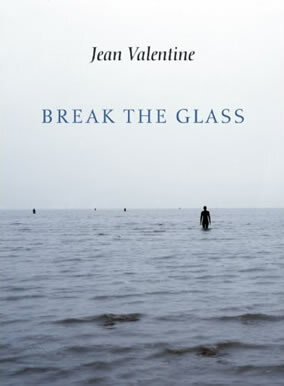 She read mostly from her newest book, Breaking The Glass, released in paperback in 2010 from Copper Canyon. Among the most engaging of the selections is the sectional poem “Lucy,” which takes the fossil of Australopithecus afarensis, discovered in 1974 by Donald Johanson and affectionately named “Lucy” as a metaphor for lots of things–motherhood, humanity’s original state, loss. In the Q & A period that followed the reading, Valentine noted that she gets great comfort in thinking about Lucy–an ancient mother figure who’ DNA helped carve out our own path. Below are three videos of Valentine reading from last night. Rodger Lowenthal is Having a House Party! Poets HAYDEN SAUNIER, GRANT CLAUSER, PAUL SIEGELL and JOE ROARTY… with special, musical guests playing blues, Irish, rockabilly, bluegrass. PAUL SIEGELL is the author of three books of poetry: wild life rifle fire (Otoliths Books, 2010), jambandbootleg (A-Head Publishing, 2009) and Poemergency Room (Otoliths Books, 2008). Paul is a senior editor at Painted Bride Quarterly. Kindly find more of Paul’s work – and concrete poetry t-shirts – at “ReVeLeR @ eYeLeVeL” (http://paulsiegell.blogspot.com/).